Photograph the City of Lights! 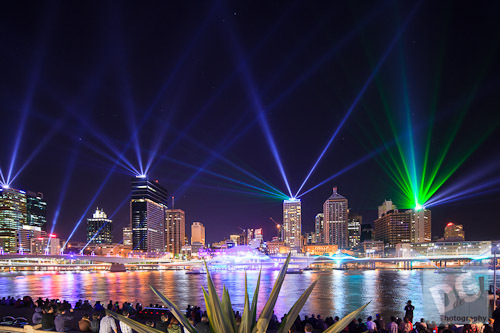 Last year, Brisbane Festival’s put on a nightly laser light show visible from Southbank. This show is happening again this year and as such we would like to help you photograph it. Photographing Laser light shows is somewhat different than fireworks or normal night landscape photography. We will guide you through the necessary settings and techniques to photograph this interesting event. Experienced photographic help on hand to help you get that magic shot. $150.00 per person (6 students maximum). You should be able to arrive around 5:30pm. This will allow plenty of time to observe the sunset, discuss technique and lock down a position. Shooting laser shows requires a DSLR camera (or some high-end Bridge cameras (super zoom)). If you are unsure if your camera will be suitable please contact us before making a booking. While it is possible to get excellent results with a film SLR, this is not offered due to the lack of immediate feedback (*however, if you plan to bring one, contact us beforehand so we can advise on the correct film speed). A sturdy tripod. “Video” tripods are not recommended. A remote release, either wired or infrared. A small torch is highly recommended. A wide angle lens. This means for the most part, a lens in the range of 10mm to 24mm for most cameras (or 16 mm to 35mm for full frame cameras – if you don’t know if you have a full frame camera, assume you don’t). Missing any of this equipment? Contact us early and we may be able to arrange a hire for the day (at extra cost to you). This course is now closed, please let us know if you would like to pre-book for future issues. | Comments Off on Photograph the City of Lights!